Offer beautiful butterflies shelter in your garden using the Prime Retreat Classic Yellow Butterfly House. Many of these captivating insects hibernate through the cold winter months, and also require a refuge during summer rainstorms. Providing this home creates a place for butterflies to hide from predators, stay dry, and rest. The front panel of this shelter has three elongated slots, mimicking crevices in wood piles or bark that butterflies often use for protection. A pitched roof covers the roost, with cedar shakes on it for added design. A hanging tab on the back of the unit enables it to be placed on a post or against a wall, while the flat base allows it to attach to a pole with a mounting bracket (not included). The back panel removes from the home, for you to place twigs and leaves in it for added shelter. The striking yellow hue enhances your flowers, and the wooden construction creates a safe haven. 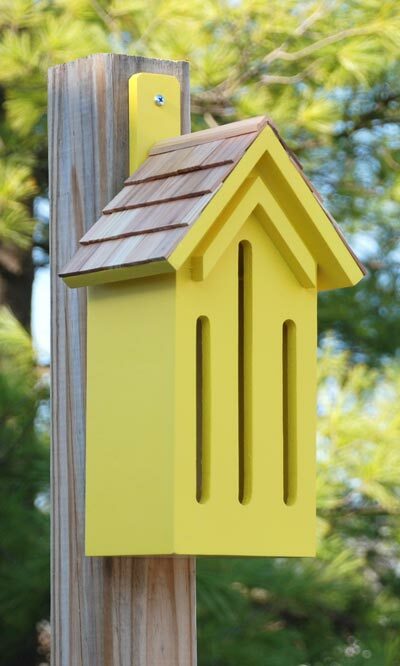 Invite butterflies into your yard with this Classic Yellow Butterfly House. Note: Climate and the elements will weather the house and change its appearance over time; however, weathering will add to the item's natural charm without compromising its function. Should you want to preserve the finish (paint), you should select a polyurethane product that is recommended for marine use (UV Rated). You should expect that once left outside, the product will weather and require refinishing.